Atlantic Pump distributes epoxy grout and coating systems from ITW Performance Polymers. For grouting and chocking pumping equipment or other applications, Atlantic Pump stocks top of the line products from ITW Performance Polymers for any environment. ITW Performance Polymers supplies an enormous range of proven high performance products and world-renowned brands, including Chockfast and ESCOWELD. Though the company name has changed from ITW Philadelphia Resins to ITW Engineered Polymers to ITW Performance Polymers, the Chockfast products have a 60+ year history as leaders in the industry. 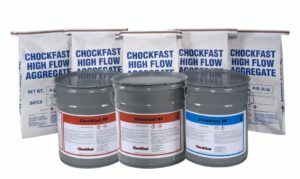 The Chockfast line of specialized grouts, chocks, and foundation construction materials improve equipment performance and reliability, increase longevity, and lower operating costs. Atlantic Pump works with ITW Engineered Polymers to deliver a value-added solutions and expertise. Atlantic Pump distributes ESCOWELD and Chockfast throughout Maine. Atlantic Pump is a distributor of ITT Performance Polymers products providing technical expertise and support. 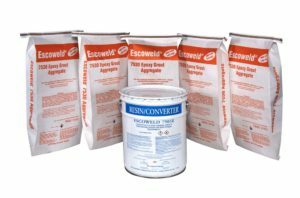 The ESCOWELD epoxy grout system provides a highly flowable grout for dynamically operated industrial machinery and equipment. As the interface between the equipment and its foundation, ESCOWELD ensures transference of static and dynamic loads generated by the equipment to the foundation.